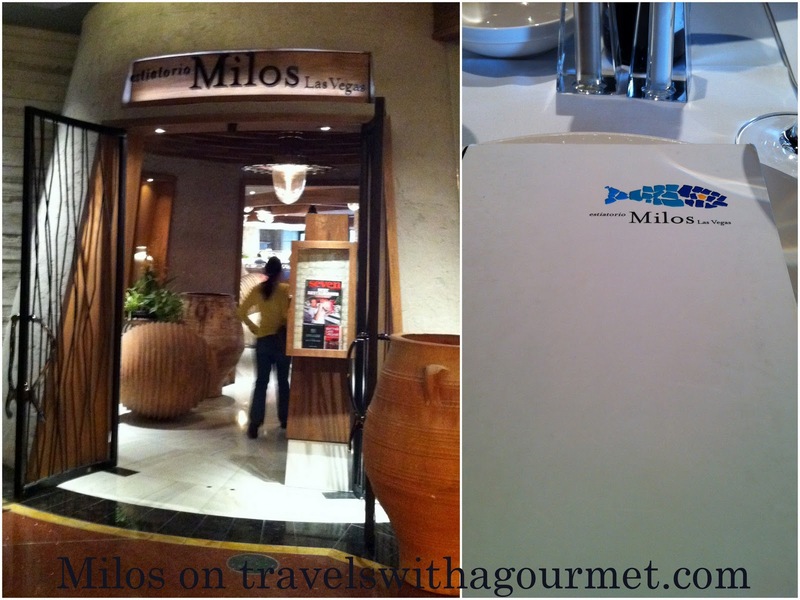 One of the best meal deals in Las Vegas is the $20.11 prix-fixe lunch at Milos in the Cosmopolitan. I knew Milos from when we lived in Montreal and wanted to try their new Vegas outpost and for just $20.11, how could we resist? 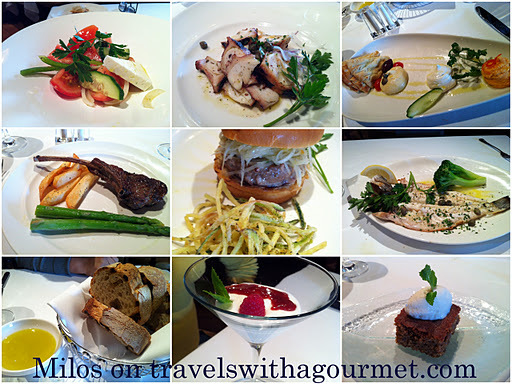 Milos is a fine dining Greek restaurant which specializes in simply prepared fish and seafood. The interiors are modern and the tabletops classic – white tablecloths and thick linen napkins, simple white plates and the tables arranged around large columns. There is also a lovely covered terrace for al fresco dining. My mom, sister and I booked a table for 12:30 and arrived to a semi-empty restaurant. We had a quick look at the lunch menu and made our choices quickly. There were a few appetizers unavailable on the menu that day (the scallops and the smoked salmon) which was disappointing as that left us with just four dishes to choose from, two of which had a supplementary charge of $10 which sort of defeats the bargain $20.11 price. We finally settled on our three choices each. Sashimi quality Mediterranean octopus, charcoal-broiled. After we ordered, a bread basket and olive oil was set down on the table. Our appetizers were served quickly – the tomato and Feta salad for my mom, the Greek mezze plate for me and the grilled octopus for my sister. The first two appetizers were fine but it was the grilled octopus that stood out and was well worth the extra $10 charge – simply grilled succulent octopus slices tossed in olive oil. By the time our main courses were served, the restaurant was already almost full. My mom had the grilled Lavraki (Mediterranean bass) which came whole but sliced open with just lemon and olive oil, again simply grilled with the freshness of the fish making the dish special. My sister had the tuna burger (not listed on the menu above) and was pleasantly surprised at the meatiness of the patty. Tuna chunks mashed together and topped with shredded onions and served with crispy zucchini fries. I chose the lamb chop (a classic Greek dish) which came with a few asparagus spears and some fat fries. The meat was deliciously charred on the outside yet tender on the inside. I could have eaten a few more chops as one really wasn’t enough. Finally, we had one of each of the desserts (they should make at least four choices) – fresh fruit, a refreshing yogurt and berry martini and the walnut pie with Saganaki ice cream. The food was very good and well-worth the price and a taste of what Milos has to offer. Next time, we’ll definitely do dinner.